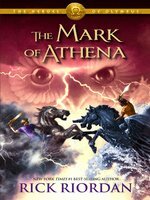 In The Son of Neptune, Percy, Hazel, and Frank met in Camp Jupiter, the Roman equivalent of Camp Halfblood, and traveled to the land beyond the gods to complete a dangerous quest. The third book in the Heroes of Olympus series will unite them with Jason, Piper, and Leo. But they number only six—who will complete the Prophecy of Seven? The Greek and Roman demigods will have to cooperate in order to defeat the giants released by the Earth Mother, Gaea. Then they will have to sail together to the ancient land to find the Doors of Death. What exactly are the Doors of Death? Much of the prophecy remains a mystery. . . . With old friends and new friends joining forces, a marvelous ship, fearsome foes, and an exotic setting, The Mark of Athena promises to be another unforgettable adventure by master storyteller Rick Riordan. lionsrcute1 - Okay. So, I've read this series from the beginning. Meaning, The Lighting Theif, NOT The Lost Hero. Sadly, starting from The Lost Hero, the series began to go downhill. I feel like Rick Rodian isn't completely writing for the joy of writing, but to competing other books, making unnecessary new problems. So many problems in fact, it's getting annoying. Now, this is just a reflection, but who cares. If you like this series, continue. It's just that it's getting to cheesy for me, and they're going throught things we don't really need to know. I'm a very impatient person, and I CANNOT STAND READING ABOUT YOUR INSECURITIES, CHARACTERS! I just want action. But I really do think that I'm starting to grow out of the series, so it's probably just me. Yup. I would mainly suggest this for people levels Q-X, if you do that, or 2nd-4th. I'm going into 6th now, and I've started this series in 1st grade... so I'm pretty sure I have a reason to be bored of this book now. So, I'm NOT STOPPING you from reading this, this is JUST AN OPINION. PLEASE do not say, "No, I don't think Percy Jackson is cheesy!" or anything like "You're wrong, Rick Rodian is an amazing writer!" Please don't give negative comments about my opinion. RIck Rodian's writing just isn't for my age anymore. Ya, you're probably not reading this anymore. I don't think anybody's gonna read this anyways... so ya. THE END.